Yellowstone Vacation Home is uniquely located on a hillside ringed by towering mountains, and is surrounded by quiet US Forest Service public lands that you can hike in and usually have all to yourself. 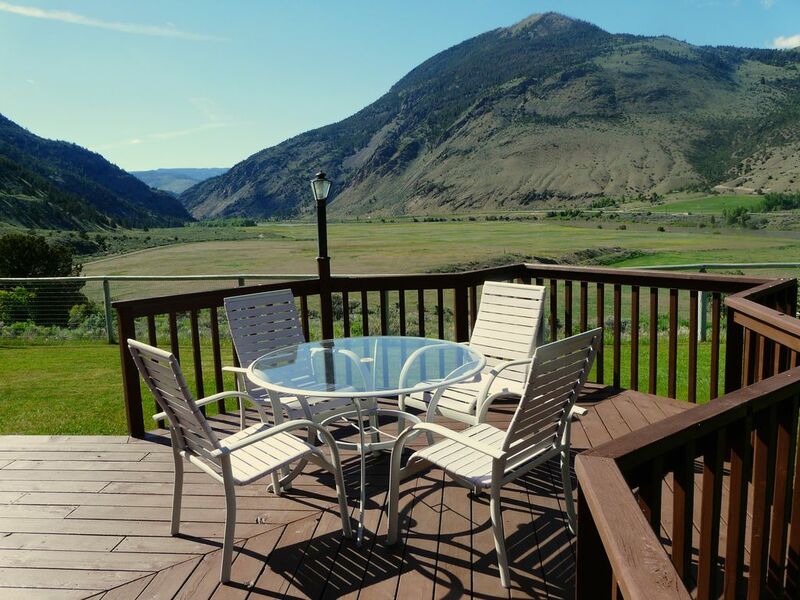 It has gorgeous views of Paradise Valley and the Yellowstone River. This home is only 11 miles (a 15 minute drive) from the town of Gardiner, the north entrance of Yellowstone Park. Standing on the deck of this home, you'll enjoy gorgeous views in every direction. If you like fishing, you'll have easy access to Yellowstone River and to all the fishing areas in Yellowstone Park. There is even a small lake located only a half mile from the house. Wildlife photographers, this place is for you! Close to the cabin you are likely to see mule deer, elk, antelope, bald eagles, big horn sheep and many bunnies! We have an outdoor fire pit with a view where you can make s'mores! We recommend that you bring a 4WD or AWD vehicle, which can be necessary on the gravel/dirt road to the house if there has been a big downpour or an extended period of rain or snow. Most of the time, and especially in June, July and August, 2WD is sufficient. There are many fun things to do in the area year round. Fishing, hiking, horseback riding and river rafting trips are available nearby and, of course, all the wonders of Yellowstone Park. This 2-story, 1200 square foot, 3 BR, 1 BA, cedar home sits on a one acre property that is fully fenced, and has a nicely maintained lawn. Pets are allowed, which works well on this fenced property. The three bedrooms sleep 6 to 8 people, with one queen-size bed, a pair of twin beds, a bunk bed, and two fold-up foam pads. Features include WiFi, forced air heating and air conditioning, a wood burning fireplace, washer/dryer, satellite TV, DVD player, and a CD player. There are a variety of games, DVDs, and CDs for the use of our guests. No smoking please. A cozy cabin feeling is engendered by the fir woodwork on most walls and ceilings. The spacious downstairs bathroom features two sinks and a shower-tub. The cabin has an extra large 75 gallon hot water heater. The kitchen is fully equipped, including a glass top electric range, dish washer, microwave, large refrigerator and a gas grill provided on the deck. This home is well supplied - we provide linens, towels, a hair dryer, all paper goods, hand soaps, dish washing soaps, laundry soaps, trash can liners, etc. The comfort of our guests is important to us! You'll love the peace and quiet as you gaze at the mountains and the Yellowstone River while enjoying a meal on the wrap-around deck. You'll see the sun set over Paradise Valley in the crux of the canyon, often with spectacular colors. Please note: Vacations in May, September and October can be a good option, because the weather is not as hot as mid-summer, and Yellowstone Park has fewer visitors. In May there are many sweet newborns to observe among the wildlife. In late Sept./early Oct. the autumn colors are at their peak. The only car-accessible park entrance that remains open year-round is the north entrance in Gardiner. Mammoth Hot Springs, the park headquarters, is only a 5 mile drive from Gardiner. The road leading to Mammoth also remains open all winter all the way through to Tower Falls, the Lamar Valley and Cooke City. The Lamar Valley is a great place for wildlife viewing during this time of the year. Our favorite activity is to soak in the outdoor hot spring pools at Boiling River. Its parking area is only 3 miles inside the park from Gardiner. You walk a half mile along a path bordering the Gardiner River, until you get to a place where a creek of hot geothermal water flows into the river. Rocks are piled up to create natural pools where the hot water mingles with the cold river water to create comfortable places to soak and relax. When you get out, even though the air is cold, you still feel warm as you get dressed. If you're looking for wildlife sightings close to the cabin and beautiful views in the quiet seclusion of pristine Montana surroundings, with easy access to the attractions of Yellowstone Park, and the fishing and white water rafting opportunities of Yellowstone River, you will be delighted with your stay at our Yellowstone Vacation Home! Keywords: Vacation rental, vacation cabin, Yellowstone, fishing, mountain, views, deck, wildlife viewing, vacation home, river view, close, lawn, fireplace, Yellowstone River, Yellowstone Park, gorgeous view, mountain view, Paradise Valley, Gardiner, fenced. My husband and I love this property because of its unique location in the middle of national forest, looking out over Paradise Valley and Yellowstone River. We lived here ourselves for 9 years and we love the pristine beauty of the Rocky Mountain wilderness. The cabin offers great views of the Yellowstone River. The cabin is surrounded by towering mountains, offering great views in all directions. Yellowstone River flows right by the vacation home down the hill at a 300 yds. distance. There is a land line that has long distance service. The cabin has forced air central heating. Plenty of space to park in the fenced yard. WiFi is available for your use. We provide olive oil, spices and herbs for cooking. Books about things to see and do in the area are provided, as well as a small collection of fiction. There are board games and puzzles for the family, and playing cards. A lovely lawn surrounds the vacation home. The wraparound deck seats 8. The cabin is only 11 miles from Yellowstone Park with all of its geothermal features and abundant wildlife. Wildlife can also be enjoyed from the cabin - you are likely to see herds of elk or deer in the mornings and evenings. We were very pleased with our cabin which is located quite a distance off the main road on the Old Yellowstone Trail giving us the solitude we hoped for. It had everything we needed and then some. The view of the canyon and surrounding hills was magnificent. Our only negative was a very step set of shallow stairs to the bedrooms upstairs with the bathroom downstairs. Bruce and Magdalena were very helpful when we needed an extra day and thankfully the house was available. Hubert, the groundskeeper, greeted us on arrival and offered valuable info to the house and area. The kitchen was stocked beyond expectation. And plenty of firewood and kindling was set out for our rather cool mornings. Thank you for making you stay so enjoyable! A nice place to stay, although be aware that it is a 20 or so-minute drive to the park entrance. We spent the entire day in the park and left early and got back after dark, so we didn't really get to enjoy the solitude of this place or the river, which is a relatively short walk away. However, if you want to relax in a peaceful setting away from the bustle of town or the crowds of the park, this is the perfect place. I would absolutely recommend it, but again, be aware that running to town for something is not a quick, easy task. Easy to get into the cabin and everything you need. Easy to work with the owners. Thanks for your hospitality. Had a wonderful time exploring Yellowstone Park. Cabin is very well kept and has everything you would need. Beautiful location to just sit out on the porch in the morning and enjoy the views. If you enjoy solitude and the quiet this cabin is for you. Thanks again to the owners for letting our family enjoy the cabin. Wonderful place to stay away from the crowds! We thoroughly enjoyed our stay in this home. It was clean, well cared for and perfect for a family of 5. After battling crowds in Yellowstone it was wonderful to come back to a place that was quiet and beautiful. We highly recommend this home! It is a great vacation spot. Yellowstone Park with its own geothermal features and wildlife is only 11 miles from the cabin. Wildlife is frequently viewed from the cabin. Please note that there is an extra charge of $10/night per person for the 7th and 8th person. This vacation home is closed from December 1-April 19. All payments must be made by credit card via the HomeAway payment system.